2nd branch of popular hotel group in Myeongdong, Hotel Skypark Myeongdong opened! 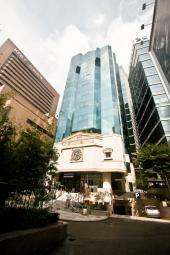 In summer 2011, Hotel Skypark Myeongdong 2 welcomes all the guests at the finest location in Myeongdong! Following to Hotel Skypark Myeongdong1, the hotel provides homelike relaxing time, modern facility and finest location. Hotel is located on the way from Jongno to Myeongdong, and the office building-like outer appearance stands out from other buildings. Baggage claim and tourist information desk are located in 1F. Check-in/out are held at the front desk at B1F, and there are also a restaurant and business center at B1F. There are 120 rooms (Standard Twin, Deluxe Twin, Triple and Standard Double). All the rooms are furnished bathtub, and basic amenities are provided same as Hotel Skypark Myeongdong 1. The hotel is 5min. walk from Euljiro 1(il)-ga station, subway line 2, the transportation to Jongno, City Hall and Myeongdong main street is very convenient. Airport limousine bus stop is located at Seoul Royal Hotel, which is only 1min. walking distance. Hotel Skypark Myeongdong 2 welcomes you offering it’s all the unique advantages to provide relaxing space and service.